A resident views the first iceberg of the season as it passes the South Shore, also known as "Iceberg Alley", near Ferryland Newfoundland, Canada April 16, 2017. The coast of Canada’s Newfoundland is commonly called “Iceberg Alley.” An iceberg is a large piece of ice floating in the ocean. Between May and July, hundreds of icebergs float through these waters. They break off from glaciers in the Arctic and float south. But one iceberg arrived a bit earlier than usual this year. It floated extremely close to the coast. It ran into ground underwater very near the small town of Ferryland. It happened on April 16, which was the Christian holiday of Easter. The iceberg is huge. Experts estimate it rises about 50 meters out of the water. 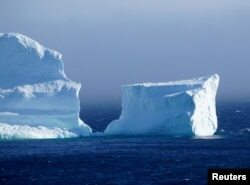 They say it is close to the same size as the iceberg that the Titanic struck in 1912. Photographs and stories about the Ferryland iceberg quickly spread on the Internet and social media. The towering piece of ice made news around the world. Newspapers wrote stories about how to travel to Ferryland, a fishing village with a population of 500 people. Visitors began arriving in Ferryland more than a month before the area’s tourist season begins. Roads filled with cars, as tourists tried to take the perfect picture of the iceberg. Maxine Dunne owns a small inn in Ferryland. 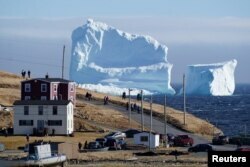 She hosts tourists who come to the area to watch icebergs each summer. She told National Public Radio that she can see the huge iceberg clearly from her window. “...This is, I would say certainly, the highest iceberg that we’ve ever seen,” Dunne told NPR. Eddie Sheerr is a local weather reporter in Newfoundland. He spoke with The Washington Post this week about the now-famous iceberg. He said strong winds from a severe storm pushed the iceberg closer and closer to shore. “It is so big and so close to a community -- like you can reach out to touch it,” he told The Washington Post. The iceberg has sat near the coast of Ferryland for almost 10 days. But the Canadian Press reported Monday that ocean currents may finally be slowly pushing the world-famous piece of ice out to sea. Ashley Thompson adapted this story for Learning English based on reports from NPR, the Washington Post, and the Associated Press. Caty Weaver was the editor.